Come for the pretty pictures, stay for the science. For Great ShakeOut, "Drop, Cover, Hold On, and Hazard Hunt"
Why aren't there any volcanoes in the Olympic Mountains? What is the Cascadia Subduction Zone, and when is the next "big one" going to hit? What’s the difference between predicting and forecasting earthquakes? How big was that earthquake? Canadian ETS morphing to Washington one? The Great ShakeOut 2014 is Tomorrow! Three Cascadia ETS events in past month?? Is Mount St. Helens seismicity increasing? Geothermal project starts soon. We forecast some small quakes near Newberry Volcano. When is an ETS an ETS? New PNSN tool - search our catalog! 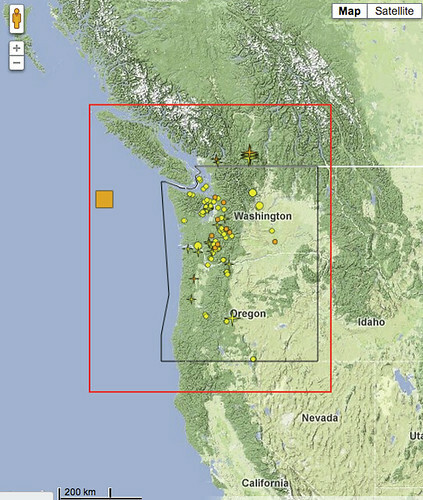 Where are the earthquakes in the Pacific Northwest? Planting seismographs causes earthquakes? or maybe ice-quakes? Repeating Earthquakes on Mount Rainier - are glaciers the culprit? Is the plague of great earthquakes this decade a sign of increased danger? Why does a volcano scream? 1-hour warning for Japanese M9 earthquake? Last Saturday, August 18, 2012 at 11:07:36 PM a magnitude 5.5 earthquake occurred east of the the Juan de Fuca Ridge, 253 km (157 miles) SW of Tofino, Canada. It was the largest earthquake near Washington since the M6.8 Nisqually event in 2001, aside from an M6.4 last year off Vancouver Island. Several moderate aftershocks followed. King 5 and KOMO TV news interviewed PNSN Director John Vidale to learn more about these earthquakes. Some PNSN web site regulars were surprised, even alarmed, that the earthquakes were not displayed on our recent earthquake map. We were a bit surprised at this response, and it made us think about what the expectations should be for our reporting about such events. This is a question we really don’t have a clear answer for, so we thought to blog about it and sample any response from our followers. We certainly recorded these earthquakes, quickly realized that they were far offshore, not large enough to cause concern to Washington residents and, moreover, poorly located beyond the crude estimate of “way offshore”. What confounds us is how best to convey that knowledge to you all. Our top priority is to provide the public and emergency managers the best information available, as soon as possible. The fundamental problem is that the earthquakes occurred far west of our network. And to get really accurate locations and magnitudes, a network should surround an earthquake, and have at least a couple of close-by stations. There are no stations nearby these earthquakes or to the west of them, because they are offshore (several initiatives are afoot to amend this by deploying “Ocean Bottom Seismographs”—but that’s grist for a future posting, and far off in time). Our lack of capability to do an accurate job locating such far-offshore earthquakes is recognized by the westward limit of our USGS-defined "authoritative region", the region where we are responsible for locating earthquakes and estimating their magnitude. Such offshore earthquakes are the responsibility of The National Earthquake Information Center (in Golden, CO), who reports on earthquakes around the world and is "authoritative" in the USA in areas not well covered by Advanced National Seismic System (ANSS) regional networks. The PNSN is responsible for the Pacific Northwest Region of the ANSS; comprised of the States of Washington and Oregon and extending offshore some 10s of kilometers to include most of the continental shelf. We also often provide earthquake information for events bordering our region using solutions calculated by other networks. On our webpages, these contributed solutions are shown as squares, not circles. The magnitude 5.5 earthquake last weekend was 40 km west of the reporting box for which we provide earthquake information on our web site. In response to a number of these requests from the public last week, we have extended the reporting area one degree further west. This isn’t by any means a satisfactory resolution. The NEIC uses a global network of seismic stations, so their locations and magnitudes of big events will be better than ours. However, even though they use a subset of our stations in their solutions (remember we exchange real-time ground motion data with all surrounding seismic networks! ), they will miss the smaller events and may have less accurate locations for smallish events. And because seismic waves take more time to travel to far distant stations, their solutions are slower. So, we have expanded the region we report on in our web site page. With the cooperation of the Canadian Geologic Survey, the California Integrated Seismic Network (CISN) and the NEIC, we post information about earthquakes near our region in a broader “reporting box” (41 to 51° N, -116 to -129° W). Significant earthquakes occurring from McKinleyville, California to Northern Vancouver Island, and from Central Idaho to the Juan de Fuca Ridge under the Pacific are now in our expanded reporting box. We use the solutions from the NEIC or the CISN when outside our authoritative regions. For technical reasons we are not currently capable of showing Canadian solutions for Canadian earthquakes—we are looking for ways to do this. The bottom line on these offshore earthquakes? "If the events had posed a danger to the people of the Pacific Northwest, we would have rapidly distributed information in concert with the USGS, the Washington EMD and/or the Oregon Office of Emergency Management." wrote John Vidale to an earthquake watcher concerned the 5.5 did not show up on the PNSN earthquake map. We hope by stretching our website’s reporting boundary west one degree to display any earthquakes the authoritative NEIC locates, we will be able to display earthquakes that might impact our region, even if that impact is only to remind us that we live in a tectonically active region. However, we recognize that putting those epicenters on the webpage is, in itself, providing incomplete information. We are averse to doing the disservice of providing really bad, and ultimately confusing, information. Also some fraction of our followers may become unnecessarily alarmed by seeing big squares offshore, and think we are about to be deluged by giant tsunami waves. The flip side is that if we don’t show (even bad) epicenters, some consider us inept, and more conspiratorial-minded folks convince themselves that we are hiding important information in pursuit of some political agenda. So while we work hard to extend our capabilities to provide really great data within the Pacific Northwest, we struggle with how to best represent the entirety of information of interest.